Lowlands is one of Europe’s most famous weekenders that’s been a Dutch rite of passage since 1993, with a greater number of foreign visitors arriving every year. It lives up to its full name – A Campingflight To Lowlands Paradise – as Holland’s best all-rounder festival with one of the most eclectic lineups in Europe. Set in the northern rural area of Biddinghuizen (try saying that after a few beers), it’s also one of the easiest European festivals to plan, with the site roughly an hour on the train from Amsterdam Schipol Airport. With hundreds of performers on site you’ll find something to get lost in, from hip-hop and indie on the main stages, to snarly early-hours techno tents. This year a few big draws are Kendrick Lamar, Stormzy, Gorillaz, NERD, De La Soul, The War On Drugs, Patti Smith, James Bay, Nile Rodgers, Richie Hawtin and Kiasmos, but the list goes on. It’s no wonder it’s sold out already! The Dutch are proud of their work hard, play hard ethic, and Lowlands is maybe the biggest collective letting off steam caper of the year. You can’t buy day tickets – once you get your wristband on Thursday you’re in it for the long haul, no annoying Sunday newbies gatecrashing the party. Every UK festival punter has horror stories of missing their favourite band while they’re standing cross-legged at the portaloos for half an hour, or they’re 12 deep at a bar run by sloths. Queueing can knock the wind out of any festival experience, but there’s no reason it should be some attainable holy grail. Lowlands has a capacity of 55,000 but your wait for a beer is as stressful as ordering a pint at your local on a Sunday afternoon – no queues. How did these Dutch geniuses solve this eternal puzzle? Eh, simple arithmetic: hire enough bar staff, have enough bars and enough toilets. And their ‘Munten’ token system is a breeze too – just buy tokens from dozens of vending machines around the site and use them at bars and food stalls so there’s no waiting for change. Oh, and there’s no queues for the token vending machines either. We’re setting the bar pretty low here, but punters at Lowlands don’t set the campsite on fire – a bit of a tradition at UK festivals when things get a little bit feral. The Lowlands campsite is a picket-fence suburb compared with the skid row UK version. There’s an abundance of toilets, showers, food stalls, art installations and bins – there’s virtually no litter. And you don’t see any belligerent messy drunks, everyone’s sound – even the lads last year in the camper van flying a Jagermeister flag like a Jolly Roger. Festivals have to stop pretending they’re ‘boutique’ as soon as they add a comedy tent, a yoga session and a van selling ostrich burgers with a handful of rocket leaves for a tenner. 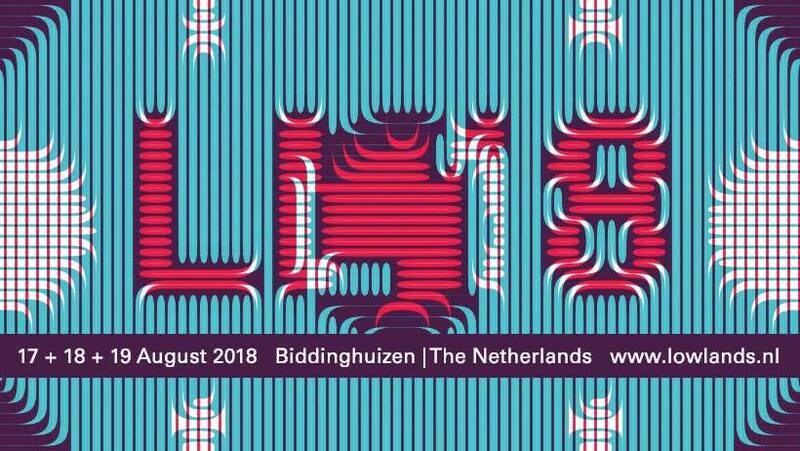 Most festivals these days offer other artistic alternatives from the music, but Lowlands has a spectacular alternative programme if you fancy taking a time out from the music stages. This year you can attend poetry and literature readings, the Dutch National Ballet, philosophy debates, outdoor theatre, cult movie specials and science seminars. And if you want something a little more daft, last year there was a giant washing machine that turned into a foam party. Let’s not kid ourselves here – northern Holland is not exactly the south of Spain so you’re not always promised scorchio weather. You could be caking on sunscreen one minute, then ducking out of a lightning storm the next. Luckily you’ve somewhere to escape if it rains. Being Dutch and hyper-efficient, the Lowlands crew make sure all stages are covered – whether that’s the big top tents, the hangar-like Alpha main stage or the various pop-up clubs around the site. Beats standing in the muck at the main stage with a Pound Shop poncho billowing around your face. Lowlands runs from August 17-19 at the Walibi Holland Event Center in Biddinghuizen, with camping from Thursday 16th. See lowlands.nl for details. Bonobo, Dropkick Murphys, Gavin James, Gogol Bordello, Grizzly Bear, Jacob Banks, De Jeugd van Tegenwoordig, King Gizzard & The Lizard Wizard, Nick Murphy, Nile Rodgers & Chic, Nils Frahm, Patti Smith, Rag’N’Bone Man, Richie Hawtin Close, Spinvis, De Staat, Stormzy, The Tallis Scholars, Tom Odell, $uicideboy$, Âme II Âme, Bazart, Ben UFO, Bicep (live), Blaudzun, The Blaze, Børns, BROCKHAMPTON, Charlotte De Witte, Daniel Avery, David August, Death From Above, De La Soul, DeWolff, DMA’s, Fatima Yamaha, Floating Points (solo live), George FitzGerald (live), Ho99o9, Jarreau Vandal, Jordan Rakei, Kiasmos, Lauv, Little Simz, Louis The Child, Max Cooper, Maribou State, Miles Kane, Motor City Drum Ensemble, Mr Carmack (dj set), Peggy Gou, Protoje & The, Indiggnation, Protomartyr, Red Axes, Rhye, San Holo, Sevdaliza, Sofi Tukker, Surgeon, Tom Trago (presents Bergen live), Warhaus, The Wombats, Yaeji, ZHU, 47Soul, Agar Agar, ALIKA & Nueva, Alianza, Amber Run, Amenra, Amyl & The Sniffers, Arp Frique & Family, Avalon Emerson, Born in Flamez, Cabbage, Carista, Cartiez, Chase Atlantic, Christeene, Confidence Man, David Vunk, Dinamarca, Dr. Rubinstein, Eefje de Visser, Employed to Serve, Ezra Furman, Faisal, Ferocious Dog, The Fever 333, Gaika, Jacin Trill, Jade Bird, Jayda G, Job Sifre, Joost, Kamaal Williams, Kumbia Boruka, La Inédita, Leafs, The Lemon Twigs, Lorenzo Senni, Luwten, Lyzza, Mahalia, Mario Batkovic, Marlon Williams, The Mauskovic Dance Band, Metrik, Moose Blood, Nakhane, Oceanic, Phlake, Portico Quartet, Pythius, Rolling Blackouts Coastal Fever, Sam Fender, Sons of Kemet, SOPHIE, Torus, Trixie Whitley, Tshegue, Thunderpussy, Txarango, Volvox, YONAKA, Yung Feurich, Zeal & Ardor. ‘A Campingflight to Lowlands Paradise’ add 20 more names to their all star line up. New additions include; Nile Rodgers & Chic, The Tallis Scholars, Blaudzun, Miles Kane, ZHU, ALIKA & Nueva Alianza, Amenra, Amyl & The Sniffers, Arp Frique & Family, Carista, Gaika, Jayda G, Moose Blood, Nakhane, Portico Quartet, Pythius, Sons of Kemet, SOPHIE, Thunderpussy, Yung Feurich. The 26th edition of ‘A Campingflight to Lowlands Paradise’ will take place at Walibi Holland in Biddinghuizen from 17 to 19 August. Just over hours drive or train journey from Amsterdam ‘A Campingflight To Lowlands Paradise’ is exactly what it promises to be: a true backpacker’s Garden Of Eden and Holland’s most adventurous cultural outdoor event, with an extensive program with over 250 acts offering only the best in alternative music, film, theatre, comedy, visual arts literature and science. For three days in August, a township with thousands of inhabitants arises in the middle of the country. The Lowlands festival features heavyweight headliners, impressive installations including the new armadillo featuring the renowned chimney stacks and no less than twelve stages (among which a cinema and theatre), going by the names of Alpha, Bravo, Heineken, Lima, Juliet, X-Ray, Echo. All stages are covered too, so you can enjoy all the music and entertainment come rain or shine. 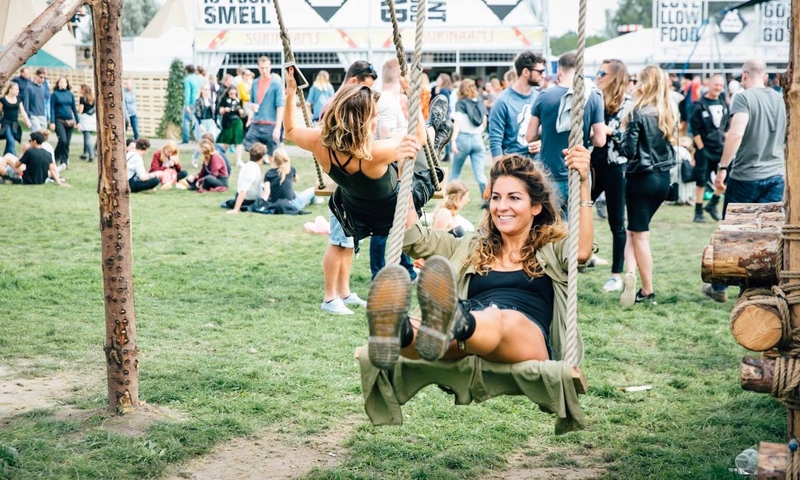 Already one of the biggest festivals in Holland, Lowlands has made a name for itself on the international festival circuit and prides itself in supplying top notch facilities for it’s visitors. Rivalling festivals such as Reading & Leeds, TRNSMT and Electric Picnic, Lowlands includes a wellness village with saunas, hot tubs and sports facilities, dozens of restaurants from all corners of the earth, food and drink stalls, a large market with everything from clothes and vinyl stores to a barber’s shop, its own currency, a local radio station, a daily newspaper (Dutch only) and, last but not least: seven luxury campsites with flushable toilets and hot showers. A Campingflight To Lowlands Paradise really is the ultimate summer holiday extravaganza with a line up to match. Lowlands has two backstage pet horses who’ve been living there since the first edition of Lowlands in 1993 who love to cuddle with the backstage crew. Lowlands has a wellness village with hot tubs and saunas and where you can participate in all day long yoga sessions and get a massage. The festival site Lowlands takes place on every year used to be part of the sea, but it has been drained in the fifties to create a brand new province in The Netherlands. It still lays 3 meters below sea level. Since the first edition in 1993 there’s always has been an area at Lowlands that’s open 24 hours a day, so the party really never stops. Lowlands has it’s own TV station: Lowlands TV (LTV) which broadcasts only original and on site created content all festival long on big screens all over the festival grounds. Lowlands also has it’s own daily newspaper with Lowlands news, reviews and previews which is distributed on the camp site every festival morning. Lowlands Festivals includes a theatre where you can see dance, comedy and drama plays + has an cinema. Lowlands only sells 3 day-tickets and no separate day tickets, which means everybody’s there for the whole weekend. At Lowlands 2016 Dutch Olympic gymnast Yuri van Gelder was dismissed from the Olympic Games in Brazil a week before the finals because of consuming alcohol. Lowlands decided to give him a second chance and offered him the opportunity to perform his routine on the rings at the Alpha stage for a huge festival crowd. What better way to extend your festival escape than by planning a city break alongside it? Plenty of the world’s most sought-after festivals offer breath-taking nearby cities just waiting to be explored. Explore the local area and indulge in culture and cuisine, visit landmarks and tourist attractions. The possibilities are endless, and can make your festival trip even more exciting. Set in the heart of Iceland’s capital city Reykjavík, Secret Solstice festival is surrounded by captivating scenery. Taking place during the summer solstice when the sun never sets, this unique festival offers an out of this world experience for attendees. The festival is ideal for combining with a city break, with Reykjavíc offering breath-taking architecture nestled amongst the city’s incredible natural landscape. Reykjavíc is hailed for its incredible nightlife, with a vast array of inviting bars and clubs scattered across the city. Plenty of day trips are also available, including dolphin and whale watching boat trips, volcanic crater and glacier visits, and plenty more Icelandic adventures. The iconic Blue Lagoon is also within travelling distance, offering the ultimate geothermal spa experience. Truly bringing Iceland’s history and scenery to life, the festival even hosts a party inside Europe’s second biggest glacier, something that cannot be experienced anywhere else. Just a short ride away from the Serbian capital Belgrade, EXIT takes place in the magical Petrovaradin Fortress set high on the banks of the river Danube in Novi Sad provides the perfect setting for the EXIT Festival. Started as a student protest in 2000 fighting for political change and freedom, EXIT continues to spread positive vibes, promoting change and positive education, supporting many community and humanitarian missions, while throwing a damn good party. Belgrade has a reputation as an all-year party city, with a vibrant and diverse party scene with everything from jazz to Gypsy folk and techno, which has its roots in the 1990s where underground club culture provided a refuge from Milosevic’s regime. Local favourites include Underground Club and Drugstore and in the summer months, the parties move to the city’s waterways – the Danube and Sava rivers – where river boats provide the venues to dance the night away. As well as music the city also has a wealth of culture and mismatch of architecture. 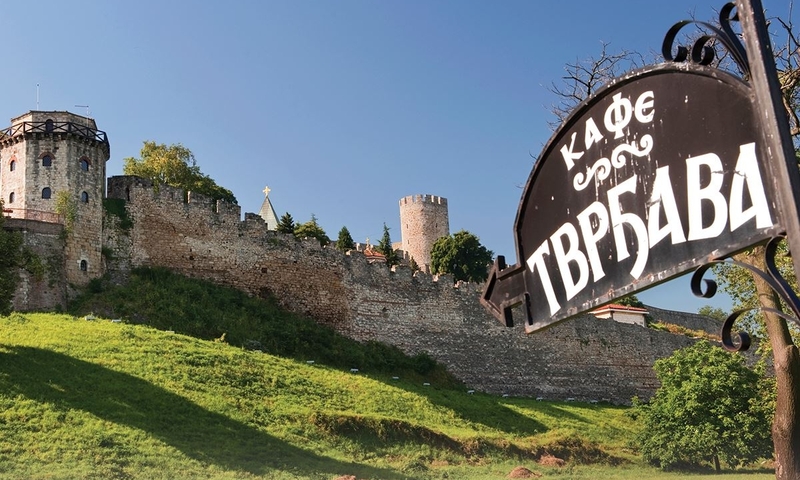 It still has many communist tower blocks but is also home to the world’s largest Eastern Orthodox church and the Wander Kalemegdan, which are ruins of a fortress built to defend the city from the Ottomans. Taking place in the picturesque coastal town of Salacgriva in Latvia, Positivus is the transporting chart-topping headliners, underground emerging talent and exciting art and dance stages to their unspoiled atmospheric coastal setting amid stunning woodland. Festival goers can dip their toes in the Baltic sea or take in the atmosphere in a hammock beneath the trees while enjoying a rich diversity of international chart toppers and underground emerging talent in this idyllic holiday location. With flights into Riga, Positivus is perfect for combining a city break in Latvia’s capital city. Riga is a hotspot of hip, bursting with alluring architecture and compelling culture an has a well-nourished art scene attracts creatives to it’s numerous galleries with Agija Sūna being the best for Latvian contemporary art. The city is also home to many Art Nouveau buildings, many of which can be seen while taking a leisurely stroll down Alberta Street, where the Riga Art Nouveau Museum epitomises the style. There is also a UNESCO World Heritage Site in Riga with buildings dating back to the 1400s and the old town is full of quaint cobbled streets filled with beer gardens and street cafes. Get ready for A Campingflight to Lowlands Paradise, taking place next to the Walib Fairgrounds, Biddinghuizen with impressive installations plus unique covers for all stages so you can enjoy all the music rain or shine. Just a one-hour car ride from cultural hotspot Amsterdam, Lowlands Festival is the perfect event to combine with a city break. Combining the spectacular festival performances with a trip to The Netherlands’ capital makes for the perfect extended trip. Absorb the city’s rich history in one of the many museums or soak up the location’s vibrant culture in the Van Gogh museum. Enjoy a serene canal boat ride or party the night away in one of Amsterdam’s diverse, intimate clubs. OFF is a festival for the discerning music fan and the place to discover the best alternative acts from around the world. A truly unique boutique music festival, OFF Festival takes place in ‘Three Lake Valley’, Katowice – a beautiful green oasis in the heart of industrial Silesia. From the greatest alternative music stars from around the world to the increasingly strong Polish scene, OFF festival has inspiring music in abundance and the organisers and crowd have one serious finger on the pulse when it comes to music. Already one of the biggest festivals in Holland, Lowlands has made a name for itself on the international festival circuit and prides itself in supplying top notch facilities for it’s visitors. Rivalling festivals such as Reading & Leeds, TRNSMT and Electric Picnic, Lowlands includes is the ultimate festival holiday extravaganza with a line up to match. ‘A Campingflight to Lowlands Paradise’ add more massive names to the already immense line up. New additions include; De Staat, Bazart, Børns, Death From Above, De La Soul, DeWolff, DMA’s, 47Soul, Agar Agar, Cabbage, Chase Atlantic, Christeene, Confidence Man, Employed to Serve, Ezra Furman, Eefje de Visser – solo, Faisal, Ferocious Dog, The Fever 333, Jade Bird, Kamaal Williams, Kumbia Boruka La Inédita, The Lemon Twigs, Mahalia, Mario Batkovic, The Mauskovic Dance Band, Phlake, Sam Fender, Trixie Whitley, Tshegue, Txarango, YONAKA. More acts will be announced soon with over 250 acts in total performing at this years event. For three days in August, a township with thousands of inhabitants arises in the middle of the country. 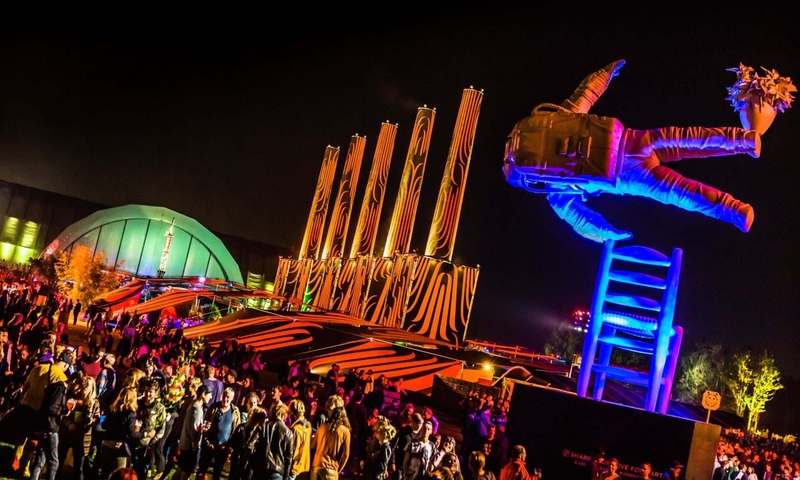 The Lowlands festival features heavyweight headliners, impressive installations including the new armadillo featuring the renowned chimney stacks and no less than twelve stages (among which a cinema and theatre), going by the names of Alpha, Bravo, Heineken, Lima, Juliet, X-Ray, Echo. All stages are covered too, so you can enjoy all the music and entertainment come rain or shine. • Lowlands has two backstage pet horses who’ve been living there since the first edition of Lowlands in 1993 who love to cuddle with the backstage crew. • Lowlands has a wellness village with hot tubs and saunas and where you can participate in all day long yoga sessions and get a massage. • The festival site Lowlands takes place on every year used to be part of the sea, but it has been drained in the fifties to create a brand new province in The Netherlands. It still lays 3 meters below sea level. • Since the first edition in 1993 there’s always has been an area at Lowlands that’s open 24 hours a day, so the party really never stops. • Lowlands has it’s own TV station: Lowlands TV (LTV) which broadcasts only original and on site created content all festival long on big screens all over the festival grounds. • Lowlands also has it’s own daily newspaper with Lowlands news, reviews and previews which is distributed on the camp site every festival morning. • Lowlands Festivals includes a theatre where you can see dance, comedy and drama plays + has an cinema. • Lowlands only sells 3 day-tickets and no separate day tickets, which means everybody’s there for the whole weekend. • At Lowlands 2016 Dutch Olympic gymnast Yuri van Gelder was dismissed from the Olympic Games in Brazil a week before the finals because of consuming alcohol. Lowlands decided to give him a second chance and offered him the opportunity to perform his routine on the rings at the Alpha stage for a huge festival crowd. Escapism is one of the primary reasons that festival-goers around the world travel far and wide to their favourite events. Wherever they are located, festivals provide a unique experience, sheltering attendees from the outside world and promoting a positive attitude and an environment of acceptance. What better way to escape the real world than partying in the Petrovaradin Fortress overlooking the river Danube? With a worldwide audience travelling from far and wide to attend, EXIT truly boasts a diverse crowd, one of the many enticing aspects of the event. The award winning festival has something for music lovers of all genres with a diverse mix of artists performing on numerous stages connected by cobbled streets, ramparts and tunnels. Dance alongside 20,000 people in the iconic dance arena while the sun rises over the fortress walls and feel truly immersed in the festival experience. With such captivating moments EXIT Festival truly allows attendees to escape from the real world. This year’s lineup is already shaping up to be the best yet, with artists including David Guetta, Grace Jones, MIgos, Fever Ray, LP, Ziggy Marley, Adam Beyer B2B Ida Engberg, Alice Merton, Maceo Plex, Nina Kraviz, Richie Hawtin, Slaves, Solomun, Take of Us. Idles and many more all set to appear. The already stacked lineup continues to get bigger and bigger with each announcement, and with plenty more names still yet to be unveiled, the 2018 edition of EXIT Festival will undoubtedly be the most impressive to date. township with thousands of inhabitants that arises in the middle of the country for three days in August. Lowlands features heavyweight headliners, impressive installations including the new armadillo featuring the renowned chimney stacks and no less than twelve stages (going by the names of Alpha, Bravo, Heineken, Lima, Juliet, X-Ray, Echo. Offering a unique selection of film, stand-up comedy, visual arts, literature, and street theatre, the festival has the feel of civilisation separate from modern society, allowing attendees to truly immerse themselves in the activities offered. All stages are covered too, so you can enjoy all the music and entertainment come rain or shine As the sun sets and the night draws in, the atmosphere intensifies, making the festival’s performances more mind-blowing than ever. Playing host to artists from a wide variety of genres, the festival undoubtedly has something for everybody, and boasts a star-studded lineup filled with iconic artists. This year’s lineup includes appearances from the likes of Gorillaz, Kendrick Lamar, N.E.R.D, The War On Drugs, Dua Lipa, James Bay, Bonobo, Patti Smith, Rag’N’Bone Man, Richie Hawtin, Stormzy, Tom Odell, Charlotte De Witte, and many more. 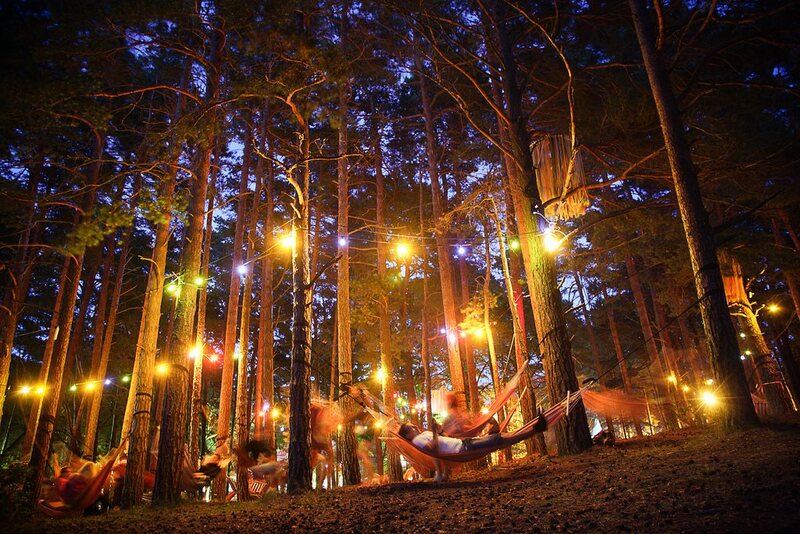 Feel truly separated from the real world at Positivus Festival in Latvia, which takes place surrounded by woodland and next to the picturesque Baltic coastline. Catering to the whole family, Positivus offers a wide range of activities for attendees as well as transporting chart-topping headliners, underground emerging talent and exciting art and dance stages to their unspoiled atmospheric coastal setting amid stunning woodland.Festival goers can dip their toes in the Baltic sea, take in the atmosphere and feel at one with nature beneath on a hammock beneath the trees, browse the arts and crafts market at ease or taste a selection of the finest cuisine at the food court. This long-running festival remains a favourite due to its separation from the real world, allowing attendees to feel at one with nature in the midst of one of Europe’s most beautiful locations. This year’s edition will see performances from the likes of Nick Cave & The Bad Seeds, The Prodigy, Years & Years, Tove Lo, Mura Masa, Lauv and more. Set amongst exquisite Croatian coastline, Sea Star Festival is the ultimate location for relaxation and rejuvenation. This beach resort event promotes tranquillity and provides the perfect opportunity to unwind, with attendees left stunned by the picturesque landscape. Watch the sunset from the beach and be part of one of the most breath taking festival experiences in the world. Truly feel separated from reality surrounded by likeminded electronic music enthusiasts experiencing the picturesque landscape alongside exceptional live performances. The festival offers a stacked electronic lineup featuring the likes of Dimitri Vegas & Like Mike, Robin Schulz, Paul Van Dyk, Francois X, Luke Slater and Tommy Four Seven plus performances from artists including as Hurts and Disciples, all of whom will provide unforgettable performances, made even more powerful by the awe-inspiring backdrop. Iceland’s Secret Solstice is a destination for festival goers with a passion for the natural beauty of the great outdoors. Each year the festival welcomes an eclectic lineup to the naturally breathtaking country for main stage sets, glacier raves, lava tunnel shindigs, midnight sun boat parties and secret lagoon blowouts. Other tourist attractions also include volcanic beaches, epic midnight sunsets where daylight reins 24/7, Game of Thrones filming locations, jaw-dropping waterfalls and the infamous Blue Lagoon.Never failing to deliver a huge lineup spanning multiple genres, the festival has continued to cement its position as one of the world’s most sought-after events. Held during the Summer Solstice when the sun never sets, the festival is a truly unique experience that cannot be found anywhere else. Enjoy this surreal phenomenon and feel at-one with nature during the festival which showcases the international artist alongside the best homegrown talent. year’s lineup includes Slayer, Stormzy, Gucci Mane, Clean Bandit, Bonnie Tyler, Death From Above, Steve Aoki, Goldlink, J Hus, Skream and A-Trak, , Dreamwife, IMADDB and more.